I am always looking for a quick dessert. When I was living in Miami, Florida, I used to frequently visit my mother-in-law at her home. It was so much fun, celebrating Thanksgiving and Christmas with her. She is an awesome cook, a wonderful mother and great friend. I love her very much. That year, since I was going to be with her for Christmas, she decided to have a Christmas Party. We made lots of treats and one of cookies she made, was one of my husband’s favorite cookies. Lace cookies are a delicate, thin cookie that is beautiful to look at, very sweet and crumbles easily. When you bite into it, it has a very yummy crunch and the cookie just melts in your mouth. There are many varieties of recipes for these cookies. Some people include different types of chopped nuts in them. I decided to use Oatmeal and Whole Wheat Flour for these cookies. When I served them, I left a jar of Nutella out, so that my husband and I could spread some on each cookie ourselves. Using a 1/2 teaspoon, drop batter onto baking sheets. (Very Important: leave at least 3 inches around each drop of batter! The cookies spread A LOT) I got about 6 per baking sheet. That looks sweet and crunchy, Yum! i have never made oatmeal lace cookies before. 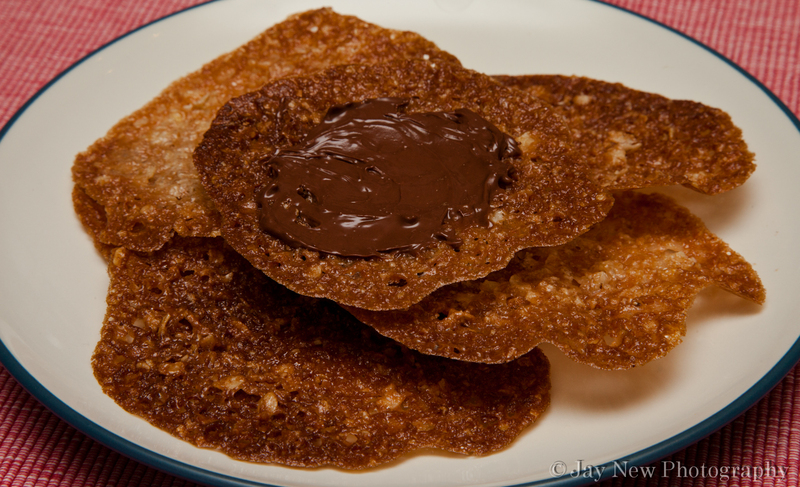 But these look delicious, and i think that spread of nutella is a genius!